Test Set with Caller ID and call-waiting Caller ID. 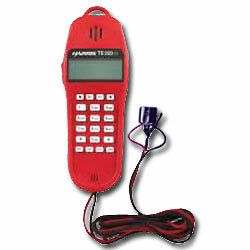 This test set is so user friendly you will think you are using your cell phone. Equipped with an oversized liquid crystal display (LCD) screen, the intuitive, common sense menus are easy-to-read and use. The unit operates on a 9V battery (included) and allows programmed "timeouts" to further prolong the life of the battery.